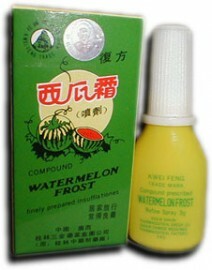 Our Watermelon Frost is prepared according to a proven secret recipe that has been handed down from generation to generation among the Chinese people. It is finely made from watermelon frost (the white frost compounded from watermelon rind and mirabilite) as the main ingredient in combination with various precious Chinese medicinal materials. Traditionally used for with ailments occurring in the upper respiratory tract. Use in the treatment of laryngitis, sore throats, toothaches due to excessive internal heat, mouth ulcers, swollen and aching gums, scalds, burns, etc. Suggested useage: Ailments in the throat, spray this formula directly onto the affected parts, in case of toothache or swollen and aching gums and mouth ulcers, spray into the caries and onto the edges of the teeth, rub the swollen part gently to relieve the swelling and pain. In serious cases, spray on affected areas a second time in 2 to 4 hours.